Malaria is a parasitic disease that is transmitted between humans through the bite of the female Anopheles mosquito. While there are four types of parasites that can cause malaria in humans, Plasmodium falciparum is by far the most deadly and common, particularly in Zambia and throughout sub-Saharan Africa. Once a person is bitten by a P. falciparum-carrying mosquito, the parasite grows, multiplies, and undergoes a series of complex life cycle changes that allow it to evade the immune system and infect the liver and red blood cells. Additional changes taking place over the course of 10-18 days after initial human exposure to the parasite cause it to develop into a form that makes it possible for the human host to transmit the parasite to the next biting mosquito. Malaria disease caused by P. falciparum may result in death within hours or a few days of infection especially in those with low immunity such as children, pregnant women, people with AIDS (not necessarily HIV carriers), and travelers from areas with little or no malaria. Malaria can also result in miscarriage in pregnant women, low birth-weight infants, developmental disabilities, and other complications. More than 16 million people are at risk of malaria in Zambia. It is estimated that in 2015, there were over 5 million malaria cases. 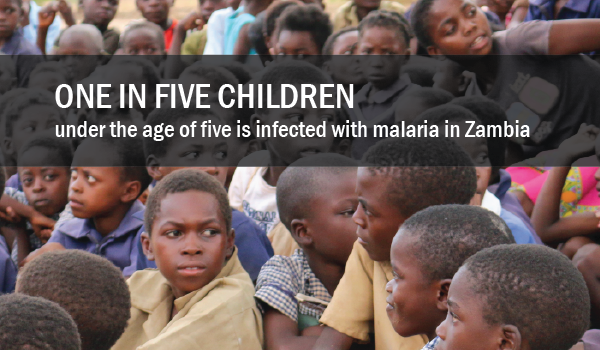 Though major achievements have been made in malaria control, the disease remains a significant cause of morbidity and mortality in Zambia, with one in five children under age five infected with malaria parasites, and other vulnerable population groups at risk. Ninety percent of these deaths occur among children under age five in sub-Saharan Africa; malaria kills an African child every 30 seconds. Those who survive an episode of severe malaria may suffer from a range of physical and mental disabilities. Reported malaria deaths have dramatically decreased in Zambia over the past ten years, though more than 2,000 deaths are still reported annually. The malaria burden has markedly decreased with the massive scale-up of control efforts in the past decade, although the disease is still a major public health challenge in Zambia and remains endemic across all ten provinces. In Zambia there is a wide variation in infection prevalence, with different levels of transmission coexisting within communities in the same district and within districts in the same province. Malaria incidence has declined in some areas, but remains largely unchanged since 2010.